Property Location Located in New York (East Village - Lower East Side), Soho Lofts is minutes from Museum of Chinese in Americas and Children&apos;s Museum of the Arts. 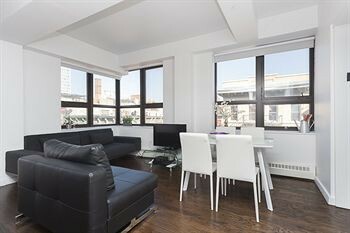 This apartment is close to New York University and Brooklyn Bridge.Rooms Make yourself at home in one of the 4 air-conditioned rooms featuring kitchens with full-sized refrigerators/freezers and stovetops. LCD televisions with cable programming provide entertainment, while complimentary wireless Internet access keeps you connected. Private bathrooms with shower/tub combinations feature deep soaking bathtubs and hair dryers. Conveniences include microwaves and coffee/tea makers, as well as phones with free local calls.Rec, Spa, Premium Amenities Make use of convenient amenities, which include complimentary wireless Internet access and tour/ticket assistance.Dining Enjoy a satisfying meal at a restaurant serving guests of Soho Lofts.